The Kepler mission has found the first confirmed known planet orbiting a binary (double) star, also known as a circumbinary planet. 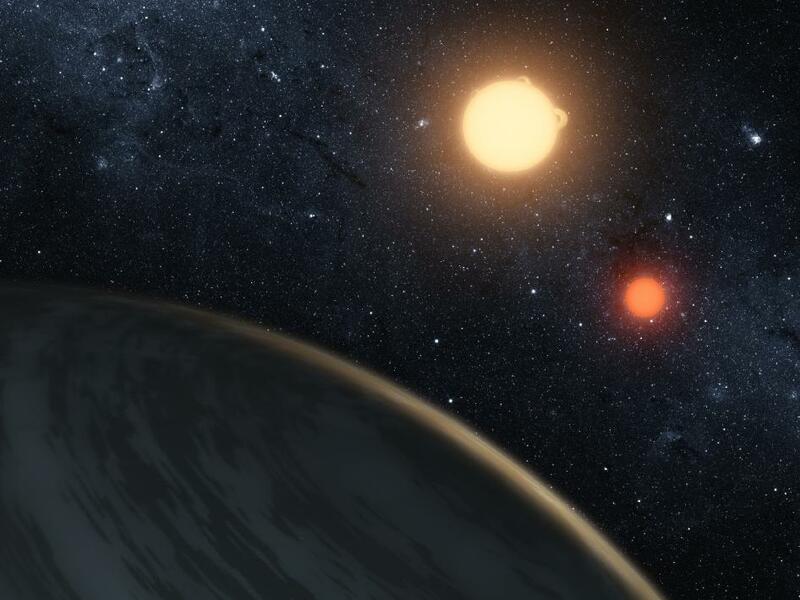 The planet, Kepler-16b, orbits a double star system about 200 light-years from Earth. The stars are both smaller than our own sun, one about 69 percent the mass and the other about 20 percent. The discovery brings to mind the hot desert planet Tatooine from the Star Wars movies (hence the inclusion of John Knoll in the news briefing), which was depicted orbiting a double star system also, but long before any planets like that had been considered likely to exist, never mind confirmed. This world though, is thought to be a cold gas giant about the size of Saturn, unlike Tatooine. As others have noted, candidate circumbinary planets have been detected before, but this is the first one to be confirmed, which opens the question as to how many others there may be out there? Most of the stars in our galaxy are in binary systems, so that would further increase the number of possible planets even more, already now estimated to be in the hundreds of millions if not billions. And on that note, the current count of known exoplanets has increased again today to 684!